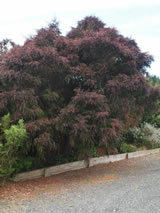 A hardy colourful small graceful tree with aromatic foliage on weeping branches with grey flaky bark. 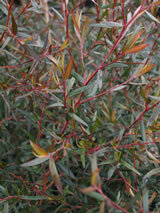 The narrow glossy leaves on red stems are a deep bronze-purple. It has exquisite flowers in late winter and spring with reddish petals, greenish sepals, prominent green centre and white stamens. Wonderful food for the bees. It grows naturally in many different sites and is very hardy. Great for growing in difficult ground.